More fires happen in the winter months than any other time of the year. During the cold months, we spend more time indoors and use different methods to heat our homes. 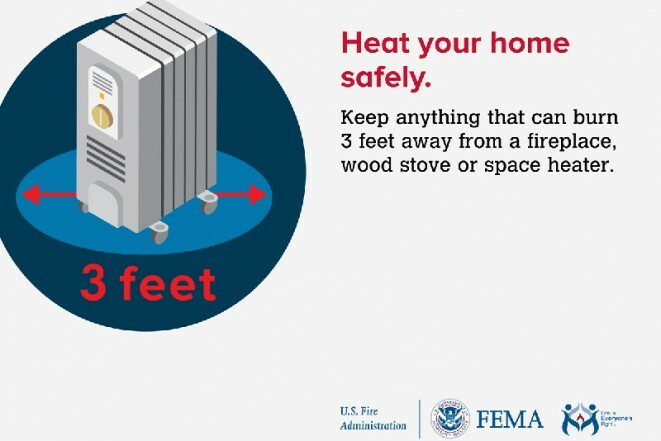 It is important to keep fire safety in mind when you are heating your home. Make sure the heater has an automatic shut-off so if it tips over, it shuts off. Keep anything that can burn such bedding, clothing and curtains at least 3 feet from the heater. Plug portable heaters directly into wall outlets. Never use an extension cord or power strip. Keep a glass or metal screen in front of the fireplace to prevent embers or sparks from jumping out and starting a fire. Before you go to sleep or leave your home put the fire out completely. Put ashes in a metal container with a lid. Store the container outside at least 3 feet from your home. Keep anything that can burn at least 3 feet from the stove. Before you go to sleep or leave your home, put the fire out completely. When heating your home, you need to be aware of carbon monoxide. Carbon monoxide, also known as CO, is called the “invisible killer” because it’s a colorless, odorless, and poisonous gas. More than 150 people in the U.S. die each year due to accidental CO poisoning from generators or fuel-burning appliances such as furnaces, stoves, water heaters and fire places. Breathing CO at high levels can kill you. Put CO alarms inside your home to provide an early warning of increasing CO levels. These alarms should be placed in a central location outside each sleeping area and on every level of your home. As always, make sure you have a smoke alarm on every level of your home, inside bedrooms and outside sleeping areas. Test your alarms every month. Have a home fire escape plan and practice your plan at least twice a year. Make sure everyone knows how to escape your home if there is a fire. For more information on heating fire safety, go to the U.S. Fire Administration.